So I will ask again! Why was there no buffer zone between Kingdom of Hungary and the territory of Boleslav??? You dont have to quote your entire bibliotheque - you just need to answer my question! If the Slavs in the peripheral areas were subordinated they would be a part of your "ducatus". The truth is they were not!!! The most probable version is some kind of agreement between them and rulers of Kingdom of Hungaria. You can consider them a "buffer zone" - for me these are territories not controlled by the rulers of Kingdom of Hungaria even in the 11th century. "The practise of dynastical divisions of the kingdom's territories commenced in 1048 when King Andrew I of Hungary conceded one-third of the counties of his kingdom in appanage to his brother, Béla. (the Illuminated Chronicle clearly states that this was the "first division of the kingdom"). There is no proof of any earlier division of the kingdom. "Tercia Pars Regni" means "one third part of the kingdom", Bela took control over one third of the kingdom. This is not a proper ethnic map. Is the map based on a reliable source? Where can I find the Avars on it? Was it a densely populated area? The map suggests (as a subliminal suggestion?) that these territories were as densely populated as the centre of the Caliphate of Córdoba? "The Prison of Nations" is a phrase of modern nationalism. Last edited by Fakirbakir; 06-16-2014 at 09:43 AM. "The hungarian king Štefan I., son of Gejza, called the Saint (whose prechristian name was Vajk) from the house of Arpads (former ruler of Nitrian territory), finished the integration process of Kingdom of Hungaria. He became the first hungarian king from the iniciative of pope in the year 1000 and he conquered the last finnougric chieftains until 1006. He was the active christianizator (he created churches, dioceses,...). In the territory of Slovakia Štefan I. (997/1000 - 1038) transferred the Nitrian episcopate into Ostrihom - "Ostrihom archbishoprice". He temporary lost entire parts of Slovakia in 1000 - 1038 conquered by the polish king who appointed the rival Arpad rulers into Nitra." - wikipedia (I hate it to quote from wiki, yet it is a redundant information so its ok). Why should there be Avars if it is the map of SLAVIC SETTLEMENTS? And yes, the map is from a reliable source! And I really dont care what this map suggests to you. ...created on the basis of Slavic experience with Magyar establishement. No it is not clear. Nobody questioned the continuity of Slavic settlements here, the question is about "Slavic autonomy" or "continuity of Great Moravia" within the borders of Hungary. There is no evidence for Nitra appanage duchy in the 10 century. Tercia pars regni in the 11th and 12th centuries is an entirely different matter. Hungarian historiography does not accept a longer occupation of northern territories by Boleslaw. Hungarian scholars (e.g. Makk) say the Polish king possessed Hungarian territories (castles along river Morava) between 1003 and 1018 or between 1015 and 1018. Could you please cite your source? Exactly the opposite!!! There is no evidence for single integrated Kingdom of Hungaria in the 10th century and even in the 11th century. Thats what I am trying to tell you. To whom did Štefan escape with his life threatened and from where? Who was it helping Štefan to save his life and to defeat Kopáň? It was Štefan I. who transferred the Nitrian bishoprice into Ostrihom (and even after that! it covered almost the entire area of former Nitrian principality). Why did he do it? Did you ever think about it? Even in the 11th century there were permanent tensions between the "Nitrian appanage duchy" and the rest of the Kingdom. The Arpads in Nitra made their own foreign policy!, they coined their own money!, they even obtained a crown! from the Byzantines as the attribute of sovereign political entity. So what single Kingdom of Hungary are we talking here for Christ sake? The 1108 year is the year after which the Nitrian territory loses all its attributes of sovereingty. Only from this year a real integrated Kingdom of Hungary started to exist! And it doesnt matter what you paint on your maps!!! Thats the problem of Hungarian historiography, not mine. M. Kučera, King Svätopluk, 2010 (I have taken the map from the internet site specializing on Slavic settlements yet its the exactly same map that is painted in the book). Exactly the opposite!!! Who was it helping Štefan to save his life and to defeat Kopáň? It was Štefan I. who transferred the Nitrian bishoprice into Ostrihom (and even after that! it covered almost the entire area of former Nitrian principality). Why did he do it? Did you ever think about it? Is there any proof? It is just speculation. Nitrian bishopric was (re)established in 1105. There was no episcopate in Nitra in the 10th and 11th centuries. Even in the 11th century there were permanent tensions between the "Nitrian appanage duchy" and the rest of the Kingdom. The Arpads in Nitra made their own foreign policy!, they coined their own money!, they even obtained a crown! from the Byzantines as the attribute of sovereign political entity. So what single Kingdom of Hungary are we talking here for Christ sake? The tensions in the 11th century were dynastic struggles, continuous "wars" among the family members of the Arpad dynasty. They have nothing to do with "Slavic political entities". The whole basis of your argument is speculation. What sort of sovereignty? In 1095 King Coloman gave some territories to Almos (his own brother). In 1107, the king decided to take those territories back because Almos had rebelled against him. I had a luck to read Matúš Kučera's works. His theories are usually baseless speculations. (e.g. according to him the size of Principality of Nitra was equal with the territories of present-day Slovakia, or the territories at Uzh river belonged to the central regions of Moravia). He is admittedly an advocate of the unified conception of Slovakia and Slovaks. Comrade, if thats everything you know about that event - than any discussion is meaningless here. Yeah, Štefans "German"retinue which consisted of 2 Slovak noblemen (Hunt and Poznan) with their armies from the north of Danube and of German force of his wife. Well, certainly there was one in the 9th century and we know the Moravian church structure has been "refreshed" by son of Svätopluk - Mojmír II. 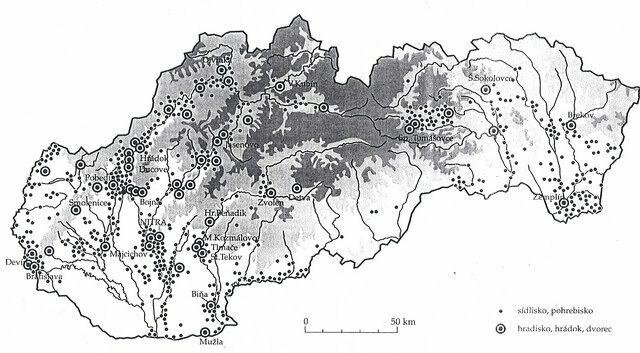 And you only need to look at the territorial range of Ostrihom diocese in the 11th century. Clearly it succeded the Nitrian bishoprice. The fact is there was a sovereign foreign policy, sovereign coinage and even the byzantine crown sent to Nitra (you can visit the museum in Budapest and take look at it). And Nitra at that time surely wasnt "Magyar political entity". The same kind of sovereignty I was talking about a little higher. In 1108 Almos tried to regain his domain but he failed. The Nitra appanage duchy remained "vacant" and in fact it ceased to exist. I dont give a damn what you think of him and his theories. Yet the map doesnt show his theories but the locations of archeological excavation sites. Last edited by Ratbod; 06-16-2014 at 03:19 PM. How does Slovakian sound to you?